"I have just returned home from our 10 day trip to Cocos Island on board the Sea Hunter. I apologize but I forgot to fill out the comment book on board the ship before departing. Please allow me to share my thoughts on the trip. The Diving: The diving was great! The week started a bit slow on the hammerhead count but by week’s end……..Wow! Great encounters with hammers, white tips, silkies, Galapagos & lots of schooling jacks, a few bait balls & more rays than I can count. All this while enjoying good visibility at all sites. I departed Costa Rica with what I consider 12 people who I am proud to call friends! I only hope I can set sail with them again soon. The Ship: The Sea Hunter was a wonderful base of operations to experience Cocos island. The cabins were comfortable and very well kept. The common areas of the ship were extremely well kept and contained all the comforts a diver might need on an extended trip. The food was very good and plenty of it. Louis was very accommodating on requests and the menu was great. The dive deck was nice sized and very well thought out. There was plenty of room for suiting up as well as great room/facilities for the underwater photographers on board. Deep See: Having Deep See on board was a very nice plus for this trip. At first we were worried it might hinder the ability of the ship to relocate closer to dive sites on the far side of the island. As it turned out the great dive skiffs made this a mute point & there was no need to reposition the ship during the week. Deep See is wonderful! I cannot stress enough that if you are a serious diver and have a passion for the sea, YOU MUST experience Deep See! Period! Deep See offers you the unique opportunity to visit the deep ocean & and enjoy something that very few people will ever be lucky enough to experience. It is expensive, but when you consider the cost to build such a wonderful vessel & how rare the opportunity to experience a dive of this nature, you will find the cost insignificant. Trust me, it’s worth it! Deep See Crew: Schmulik is truly a master at his craft. He was very informative and really made the dive fun as well as educational. You cannot help but get excited at his enthusiasm and be impressed with his precise touch in operating Deep See. I have no problem saying that you would be crazy not to take advantage of an opportunity to experience a dive on Deep See, you will never forget it. Eric was also very helpful and is a great addition to the team. 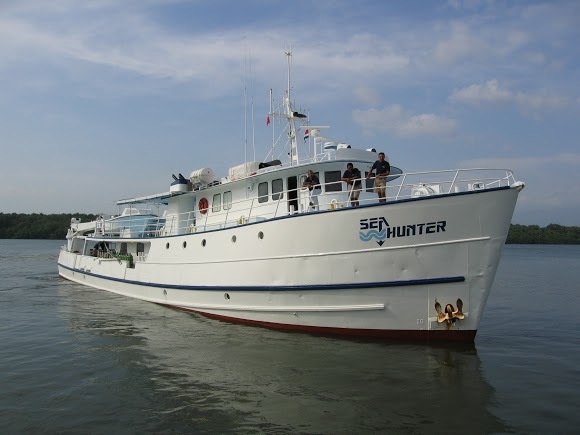 Conclusion: The entire Sea Hunter Group was wonderful and I can’t wait to return! Cocos Island is a very special place and if you are lucky enough to plan a trip there, there is only one operation to sail with. That’s the Sea Hunter family. Please pass on my sincere thanks to the entire crew and let them know I will see them all very soon."